The Summer Heat is here. The heat of the Summer certainly shifts my skincare and haircare routines. My combo skin and temperamental hair go from combo-normal to oily in the Summer months. I find that I need to wash my hair more frequently and also I need to switch up my products for better results. One switch I made recently is giving me awesome results! 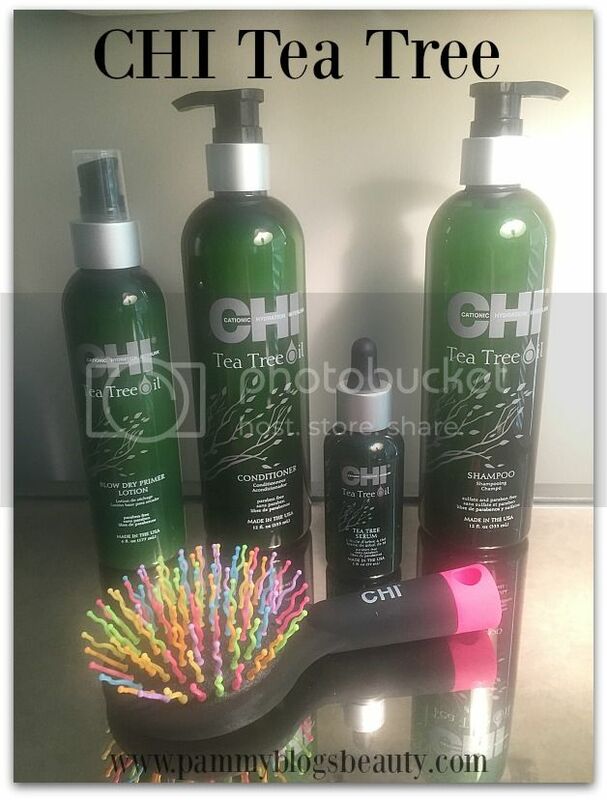 I switched to the CHI Tea Tree line of hair products. This peppermint and tea tree oil infused line is just what my hair and scalp needed for this time of year! These products are so refreshing to use!!! The key ingredients are tea tree oil, peppermint oil, silk, and chamomile which all work collaboratively to purify the scalp while balancing oils and maintaining optimal moisture levels. The tea tree oil, an antioxidant, removes buildup while replenishing moisture by unclogging pores. The silk also replenishes moisture and retains strength and shine as the chamomile soothes the scalp. This haircare line offers a gentle solution for replenishing your scalp to achieve incredible strength and shine. This cleansing and conditioning duo is such a refreshing and invigorating step in my morning getting ready routine! I seriously look forward to using these products. The minty sensation is fabulous! The shampoo thoroughly cleanses my hair and scalp and removes impurities while also balancing oil and strengthening my hair. The conditioner lightly conditions and moisturizes. I tend to need more leave-in conditioners when I use this as it is pretty light. However, I still enjoy it. This is a lightweight moisturizing priming lotion for your hair. I just apply it throughout my hair after towel drying and then I comb through. It preps hair for styling while providing thermal heat protection. It also provides protection for sun, too! This is a fabulous final step in my hair care routine. Just a couple drops of this peppermint and tea tree infused serum leaves my hair super shiny and protected from the elements. It nourishes hair and leaves it super smooth and silky. You can also use this as a pre-cleansing scalp treatment. In additon to the CHI Tea Tree Collection, I also tried out the adorable and colorful little CHI Kabloom Brush. I am always looking for good quality small brushes for my purse or for my daughter's hair (both my daughter and myself have very long and thick hair). The CHI Kabloom Brush is a little power packed brush that is not only brightly colored with squiggle shaped nylon bristles but also adds fun to every stroke. It is a great beauty accessory that fits easily in your purse, gym bag or brief case. As an added bonus, the reverse side of the brush has a mirror to check out your great style. This brush detangles hair easily and is just super cute! If you are looking for some refreshing hair products to add to your routine this Summer, look no further than CHI's Tea Tree Oil Collection! I love the items that I tried out and am curious to try a few more things from the collection.